Some cars have had longer lives–the Volkswagen beetle comes to mind–but not very many, certainly not in the U.S. From its introduction in late 1962 as a 1963 model, until its cancellation in 1991 (or 1992, depending on the source), the Jeep Wagoneer was one of the few American vehicles that stayed in production for virtually 30 years. The Wag even managed to remain evergreen during its entire long run. Thirty years is a long time. As this vehicle was being readied for market in 1962, there were missiles in Cuba, Frank Sinatra was still putting music on the pop charts and a Studebaker was pacing the Indy 500. In 1991, the Berlin Wall had been down for only a couple of years and the pop charts were ruled by Paula Abdul and Mariah Carey. Through a span of seven presidential administrations, one thing was constant – you could still go and buy a Jeep Wagoneer. And not a different vehicle with the same name, like an Olds 88 or a Chrysler New Yorker. You could buy the same Jeep Wagoneer. Only its level of sophistication (and its price) were different. It is hard to tell the story of the Wagoneer without starting with the the original all-steel Willys Jeep station wagon that debuted in 1946. By 1961, this Brooks Stevens-designed civilian offshoot of the military vehicle so familiar to millions of returning servicemen had been in production for 15 years –an eternity by contemporary standards–and it would stay for a bit longer, remaining available through 1965 in a 20-year production run. 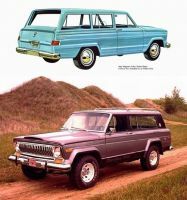 Brooks Stevens was brought back to design the Jeep Wagon’s successor, the Wagoneer. 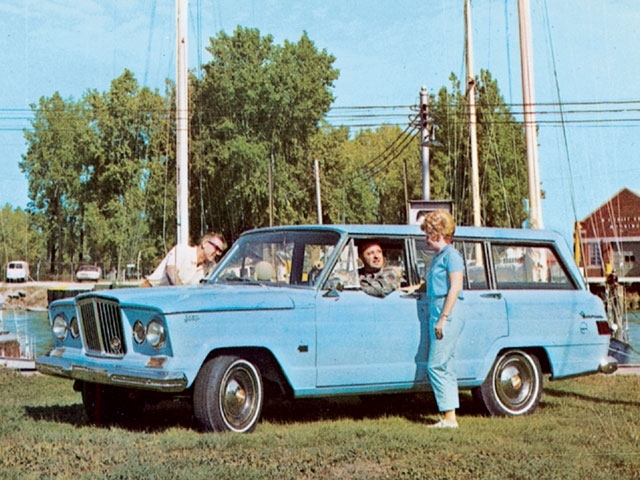 The 1963 Wagoneer (made by what was by then the Kaiser Jeep Corporation) was a thoroughly modern and unique vehicle. It was trimmer than the International Travelall, and unlike Chevy’s Suburban, came (at least at first) with a choice of two or four doors. Though initially available in two-wheel drive, the four-wheel-drive version sort of defined the vehicle for its entire life. 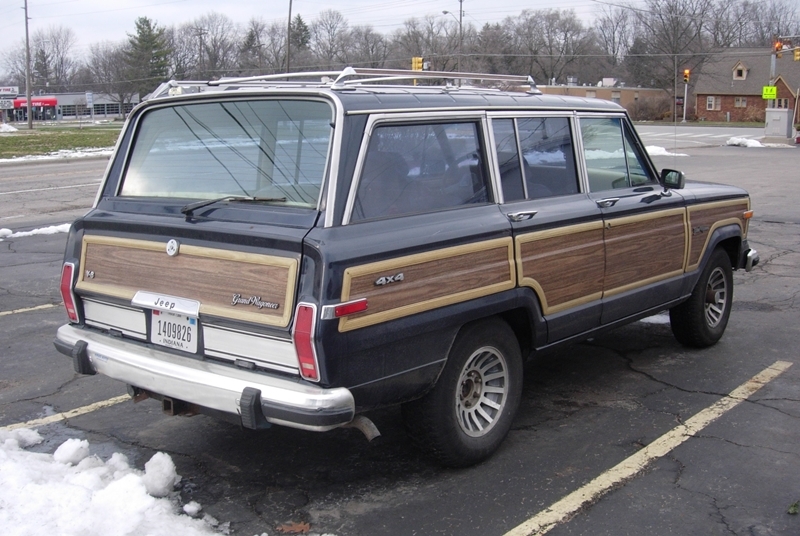 From a power train standpoint, the Wagoneer was always a bit of a mongrel. Little Kaiser Jeep never had the luxury of a full line of engines, so early versions of these wagons came with a confusing array of Willys, AMC and Buick power plants. AMC’s 1970 purchase of Kaiser Jeep settled the issue by making all future power plants pure-AMC. It’s a shame that neither of these grilles survived past 1978. All through the 1960s and 1970s, the Wagoneer continued its march upmarket, with the 1974-on Cherokee (here) offered as a more basic vehicle. 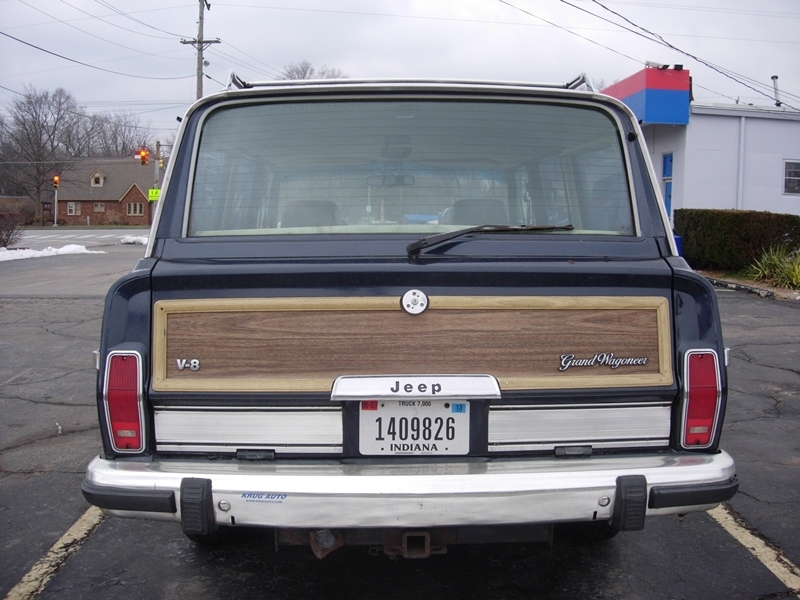 The Waggy brought out ever-nicer versions, culminating in the Wagoneer Limited, which morphed from a trim package in 1978 to a full-boat luxury vehicle by 1982. 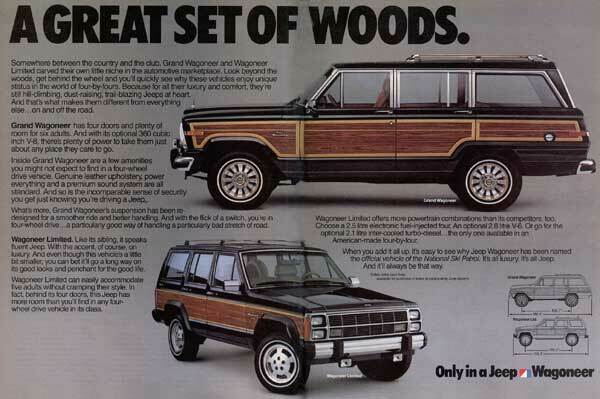 The 1984 introduction of the XJ Cherokee resulted in the big boy’s final name change: Grand Wagoneer. In the 1980s, the Wagoneer/Grand Wagoneer seemed to follow the general upward mobility of American society. By that time, the Wag had become a favorite of what would later be called the Range Rover set. All of that leather, thick carpet and extra equipment had added about 750 pounds to the vehicle, bringing the total weight to around 4,500 pounds. Even so, you’ve gotta give the customers what they want, right? I remember quite clearly being of the mind that AMC had let the GW go soft, that it was selling out to The Man by swaddling Dr. McDollar in such luxury in what was supposed to be a real man’s basic Jeep. But I should have realized that the market for a basic Wagoneer with a vinyl and metal interior existed only in my mind. AMC did what it was supposed to do: it followed the money. Except for a 1980 low of around 10,500 units, the AMC-era GW was consistently good for no less than 12-14,000 units and, in its best years, sales approached 30,000. By the time Chrysler purchased AMC, in 1987, these things were generating profit-per-vehicle of around $5-6,000–a good reason why the Wag continued to roll down the lines in Toledo after the GW’s companion pickup truck, the Gladiator (CC here), was axed following the Chrysler purchase. Many vehicles with long production runs often finish out their lives as inexpensive fleet queens, or de-contented blandmobiles for buyers too cheap or conservative to spring for the hot new replacement. Not this one. The consensus seems to be that the GW’s last five years were its best. Contrary to popular belief, Chrysler did not completely ignore the thing, but instead oversaw the rollout of its final 1988 upgrades, which included remote keyless entry, an overhead console and a rear wiper. The old girl even got upgraded to a four-speed automatic transmission in 1990, albeit one still made by Borg-Warner. However, the basics remained the same: The carbureted AMC 360 V8 (and not the identically sized Chrysler V8) would be used through the end of production. In those years, buyers of GWs were among the industry’s most highly educated, highest earning, and most loyal buyers. So with all of this going for it, why did Chrysler pull the plug? There are several reasons, not least of which was that the vehicle’s sales dropped precipitously in its final years. In 1989, production dropped below the 1980 low, to just barely over 10,000 vehicles, and it would get worse, down to 6,449 units for 1990 and 1,560 for the final year of 1991. At least one source indicates that a smattering of them might have been made in 1992 (here). True, the economy was not particularly good during those last three years, but there is no denying that the old GW had seen few significant changes for years. Chrysler also seemed to have stopped promoting it, at least to any significant degree. In fairness to Chrysler, the XJ Cherokee was about to be joined by the new Grand Cherokee in 1993, and it was probably not unreasonable to believe that GW buyers would migrate to the top-line version (called – you guessed it – Grand Wagoneer). It turned out Chrysler was wrong, as fewer than 6,400 ’93 GW-trimmed Grand Cherokees found buyers before that particular trim level was trimmed from the Jeep catalog. We cannot, of course, avoid the question: did Chrysler make a mistake? Might a small investment in airbags and Mopar Magnum power have extended the life of the Grand Wagoneer and made it a booming success as a Range-Rover fighter in the go-go 1990s? Or would the ancient platform have been a gigantic financial sinkhole that would sell no more than about 15,000 per year despite how many millions were invested? The debate will rage on for years. In a way, the Waggy continues to live. The Wagonmaster (here) is a company in Texas whose business is to restore and resell Grand Wagoneers to those who really want (and can afford) them. I guess it’s easy to spot the vehicles with the most dedicated fan bases by how much interest there is in the old ones. By this measure, the GW has to be in the top tier when refurbished versions regularly seem to sell for 40 large. In the classic Oscar Wilde novel, Dorian Gray was an attractive young man who sells his soul so that he can remain forever young while his portrait ages from his relentlessly hard living. 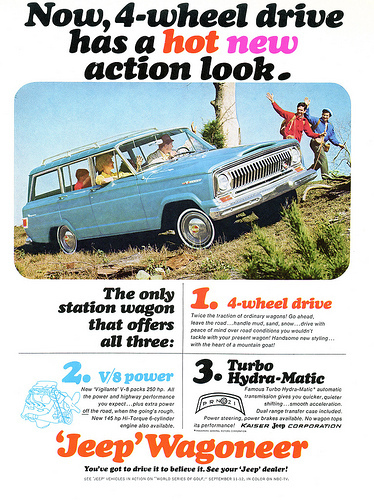 The Jeep Wagoneer had a run of nearly 30 selling seasons. Like Dorian Gray, the Wagoneer looked good during its entire life, and some of its best years were its later ones. And, like Dorian Gray’s portrait, the Jeep’s first two makers (Kaiser Jeep and then American Motors) quickly aged and took on a deathly pallor. It took longer, but the same happened with Chrysler. In fairness, the Waggy was not a perfect Dorian Gray, as it had been the beneficiary of quite a few updates to keep it new. 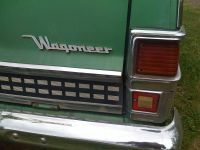 But upgraded or not, the Grand Wagoneer finished out its life using the same sheet metal stampings and a lot of other hardware that was brand new in the 1963 version. Many of us who have passed a certain age like to joke that we get better looking every year. It’s usually not true, of course, but for a certain long-lived Jeep 4×4 wagon, its multiple makers managed to pull off that very feat. Note the wreath. The Cadillac of SUVs? It’s amazing not only how many owners Jeep had over the lifetime of this car, but also all the different car company-sourced parts used in it. I don’t think the vintage-’63 body Grand Wagoneer could’ve survived longer even with substantial upgrades. It could’ve been redesigned to look similar, much like Land Rover has done with the Range Rover several times. Although I don’t think Chrysler ever would’ve invested that much in another Jeep around the same time as the Grand Cherokee, especially when the GC was selling so well. This is easily one of the most iconic American cars of all time. Great piece! I also love how it was driven by just about every yuppie in an 80’s movie. I’m inclined to agree, even though pa of me would’ve loved to have seen a US version of a Range Rover or Toyota Land Cruiser. Still, a coworker drives one that was redonenand updated by the Wagonmaster, and I’ve got to admit that it’s one helluva sweet ride. 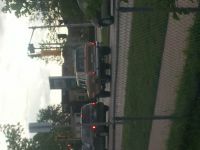 On the other hand, no amount of tweaking can belie its origins as a Kennedy-era truck. Regarding BB, I love that the producers opted to have Skyler’s Grand Wagoneer be a well-worn example – it’s presentable, but definitely not a show car. Like most of the vintage Jeeps still in use around Albuquerque. BB has great car casting all around. Outstanding article. Somehow, these looked fresh until the last handful of years, when they simply became venerated. Some neighbors when I was a kid had two of the two-door Wagoneers in the 70s and 80s, complete with the Indian-weaving tape stripe. One was baby blue and the other was tan. Am I the only one who thought the back side windows on these were all wrong? I’m also with you on the round-headlight AMC grilles were the best on these. 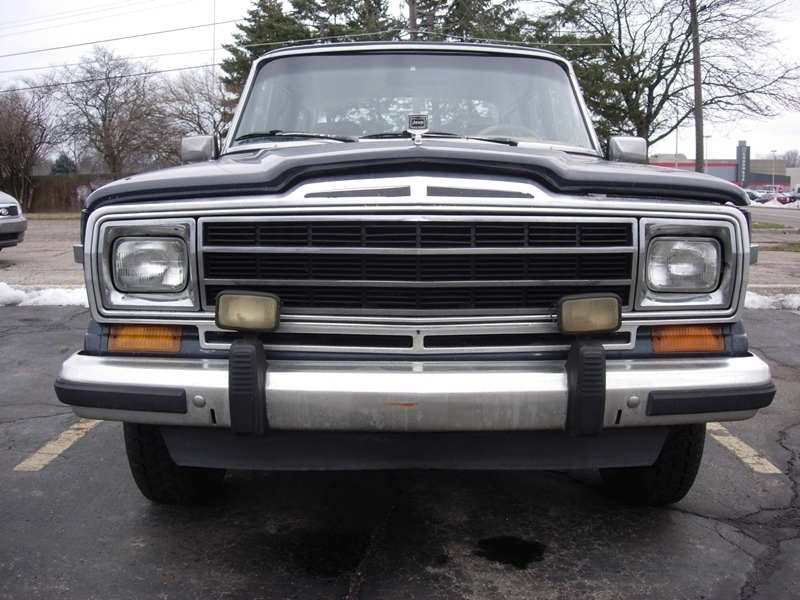 I know that moving to square headlights was inevitable but neither AMC nor Chrysler managed it with the same good style as those round-headlight grilles. It sounds like your neighbors may have had the Cherokee instead. 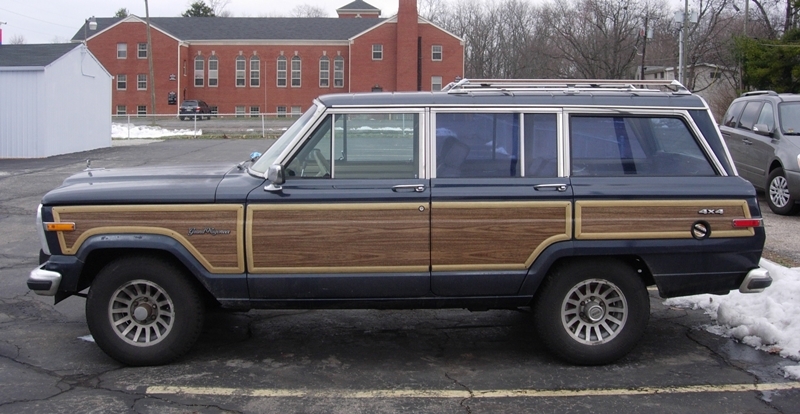 I had never even known that there WAS a 2 door Wagoneer until I started researching this one. The 2 door looked like a 4 door missing 2 doors. The Cherokee seems to be the same as the 2 door Wag, except for changes to the greenhouse. The minor change to the rear side windows changes the whole look of the car. We will have to put our Pacific Northwest guys on the task of finding a 2 door Waggy. There cannot have been many made. The Cherokee was more of a Blazer/Bronco competitor in 2 door from, hence the different roofline, a friend of mines mom had bright orange 77 or Cherokee with the indian blanket upholstery. It looks like AMC took the old 2 door Waggy and fashioned an insert to go into the old rear side greenhouse area and voila – a Scout/Blazer competitor! I would have bet that the doors on the Cherokee 2 door were longer, but from looking at pictures, I don’t think they are. The new roof plays visual tricks on us and makes it look that way. I am just remembering that when I was a kid, we had some neighbors who seemed a little odd. They were an older couple who did not seem to have ever had kids. Around 1971 or so, they had two cars – a lower-level Mercedes sedan and a Jeep Wagoneer. Very out of place in a neighborhood full of Impalas, Catalinas and Galaxie 500s. It was the J-100 panel truck that AMC used. You think the two-door Wag is rare? I have NEVER seen a panel truck variant, outside of the Kaiser sales brochures. But the side sculpture is identical to the later Cherokee. Obviously what they did is just cut an opening in the behind-the-doors panels and put in glass. Odd they didn’t just put a glass sheet where the panel was used; but I guess they were trying to ape the Blazer and Ramcharger. The paint on the first Cherokees is a giveaway – paint the roof behind the front doors, to the sill, white – to suggest a separate or removable top. I never would have put that together. Wow. It is as though when Brooks Stevens and Willys put this thing together in 1961 and 62, they said to Kaiser/AMC/Chrysler “Here is the kit for everything you will need for the SUV boom over the next 30 years.” A very clever re-purpose of an early sales-dog that was the panel truck. Two door Wagoneer? That’s the proverbial needle in a haystack, and I haven’t seen one….ever? Probably way back in the day. I’m sure its production was very low. You like “needle in a haystack”? Try finding one of the early panel trucks. 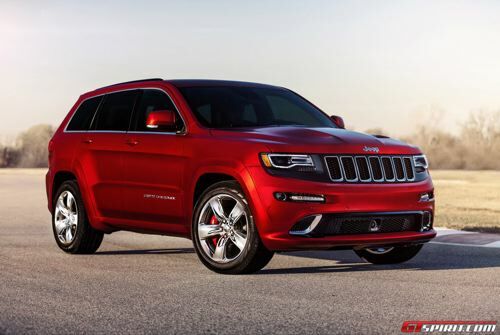 You’re right, JPC – they drove Cherokees. Thanks for jogging my foggy memory. I agree with you Jim that the rear side windows on the Cherokee don’t look too good. I think the windows on the 2 door Wagoneer are better. I like the round headlight with full width grille front end the best. Where is Chet Ripley when you need him? You know what they put in hot dogs don’t ya? Probably one of the few 2-door vehicles that did not have longer doors than its 4-door counterpart. The Wagoneer isnt a Rangerover and couldnt claim to be, range Rovers have great on and off road ability and while these jeeps have a good turn of speed they are not very good on road at speed where as the RR was used as a motorway patrol vehicle in the Uk. Ive had a high speed trip in a wagoneer and I dont want another 4 coil suspension in the RR is missing from the jeep. Handy for towing horse floats and the like the jeep was overshadowed by the LandRover and Toyota landcruiser up against those you can see why Jeeps didnt sell. Here in the US, most Range Rovers were purchased to ferry their well-heeled owners to country clubs. For a time, these Jeeps rode that same fashion wave. I always thought the thing was playing up a division when it was selling to that demographic, but sell it did. It might be true that the Range Rover was a better car on the road. But it was used extremely much fuel and the quality was very, very bad. Here i Norway this range Rovers (and Jeeps) has always been very expensive cars (due to the taxes when you buy it), but the quality of the Range Rover has always been very very bad. They are very unreliable already when the get past the first 2 years. Land Rovers are maybe even worse. And they are extremely expensive to repair. So I’ll understand those who chose the Jeep before the Range Rover in those days. Even when the Range Rover was a better car to drive on the road. I think the Wagonmaster folks are out of their mind. $40k for a vehicle made in 1989? Regardless, great write-up on what is most certainly a classic. Just not a $40k classic. Wagonmaster’s customers may be out of their minds, but Wagonmaster themselves are not – they seem to have a good little business going. I can name any number of new $40K vehicles I’d turn down in favor of a rebuilt Wagoneer, assuming the rebuild is done right. Cool Cruisers of Texas occupies a similar niche in the Land Cruiser world, with a similar value proposition. Which would you rather have, a new Lexus RXwhatever or a pristine FJ-60? Compared to what Icon is asking for their restomod rebuilt Land Cruisers, Broncos and CJ3s its a bargain. The late wife and I had a 1990 in the middle of the last decade, a gift from her parents who had bought it as a two year old car (dad would NEVER buy a new car, let some other sucker take the depreciation, yes he was excruciatingly cheap). I adored it, and would still have it now were it not the little matter of having spent its first thirteen years in Bangor, ME. So what if it did 12mpg city, 14 highway? I loved running it down I-95 playing near-bumper tag with the inevitable greenie in a Prius doing 55 in the left lane. They moved. Yes, I should have made the point that these did not like salty climates AT ALL. This is the reason they were never popular in Canucikstan. The Waggy had a well deserved reputation a being a rust-bucket and a gas guzzler. I recall seeing one in a car museum in Reno with a Jaguar V-12 fitted to it. Cool. That was made by Bill Harrah of Harrah’s Casino’s fame. It was what he used to get from his house at Lake Tahoe to Reno in the winter. It actually has a Ferrari V12 out of a Ferrari 356 and the manual trans to boot.. They called it the Jerrari. Pretty damn cool… I thinks it’s at the National Automobile Museum with alot of other beautiful cars. Jag V-12? I would run away screaming from that one. AMC offered them with the 401 for several years. I still think these would have been a hoot with Chrysler’s 5.9 Magnum from the mid 90s. I think it depends on who was running the place when the Wagoneer was built. We had a 1968; a Kaiser. That thing had many problems; but the only visible rust was where the cheapo paint was lifting off flat metal near seams. Tapping the door panels and other spots suggested a heavy, thick build. The Parks Department had an early-1960s Wag they used to drag a skid over the ball diamonds; it, too, was holding up well. Now the AMC-era ones…were rusting so fast it was frightening to behold. Did it just seem that way, because there were more of them?…or because they went with thinner steel? Or, recycled steel, as Ford was doing? Nobody can say this late. Another change, apparently, from the Kaiser era to the dawn of Chrysler. It turned out that my old man spent more time on the Interstates with his than he had thought he would; and the maximum speed for those boxes, in Kaiser dress, was basically 60-62. Faster than that, you’d get lift from the underside of the chassis; the whole rig would rise up and start to wobble, slowly, side to side, on those leaf springs. A frightening thing, even for a kid as a passenger. There were numerous underside changes in the AMC run. The wheelbase was shortened an inch, from 110 to 109 inches. The front shaft was moved from the right side to the left. Saginaw variable-ratio steering was made standard. AND…there was, IIRC, a plastic air dam up front beneath the bottom of the radiator. So this is how much luxury costs: 750lbs. 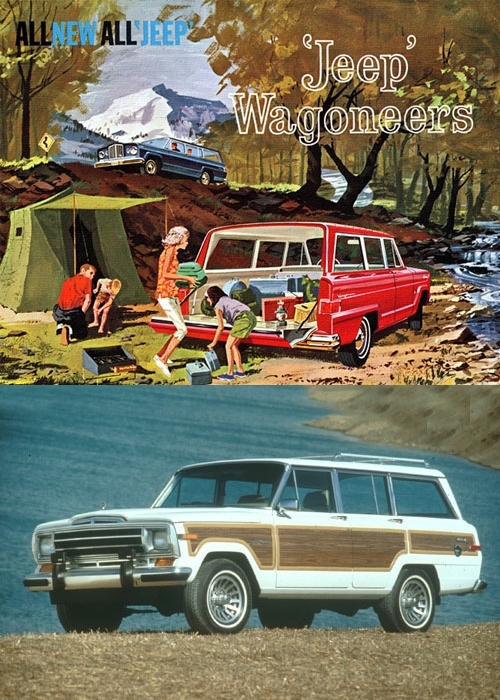 What was the original Wagoneer’s MSRP? Minus all the fruit, it can serve as a rough approximation of inflation. Using the Corvette as a basis, I’d say the $ is about 1/12 what is was in ’63 (~$4K to $49K as of 2012). Naturally this isn’t exact since modern versions have more goodies & probably greater production efficiencies. Interesting question. I found a source (How Stuff Works) that listed the ’63 Waggy’s price range from $2546 (2wd 2 door) to $3332 (4wd 4 door). This was fairly reasonable, as it was no trick to get an upper level Buick or Chrysler to $5k around then. The 91 seems to have had a base price of just under $30K. Straight inflation would have run the price up to about $15K, and the increase doubled it. The answer is/was: Entirely different market. 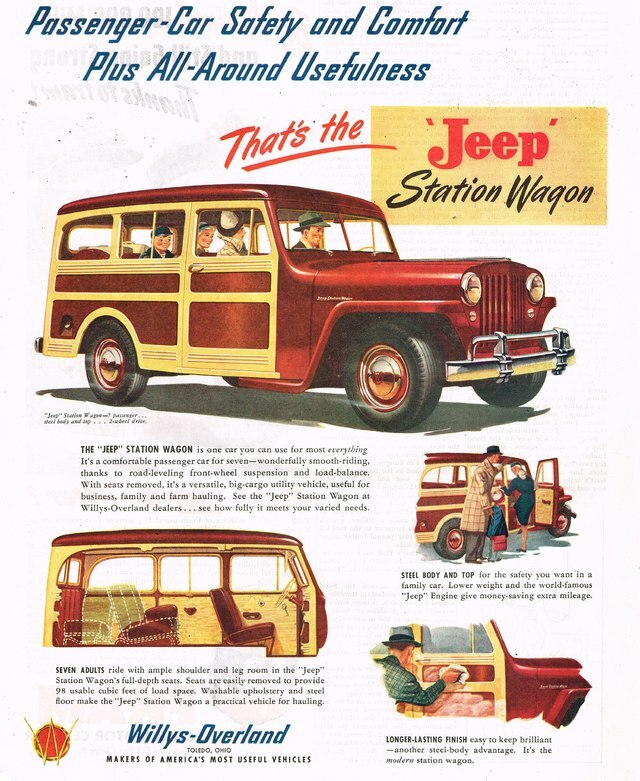 The Wagoneer as conceived was a modernization/replacement for the “Basket Weave” Willys Jeep wagon. It was a utility vehicle; Brooks Stevens cribbed much off the then-planned Chevrolet wagons (look at a 1961 Brookwood in profile and then a Wagoneer, and tell me it’s not so) but it was plainly a no-nonsense institutional rig. We had a 1968. Vinyl floor matting; no armrests on the rear doors. Naked metal all throughout; the dash-padding was the exception that proved the otherwise spartan level. This in SPITE of the fact that drivetrain-wise, it was top of the line: Buick 350, THC, two-speed transfer case. Because that’s what railroads, highway departments, park maintenance crews wanted. AMC saw a change, and strove to lead it. It was they, who put Country-Squire-type woodgrain on its side. It was they who wrapped the seats in leather; who put the fancy round instruments in the Willys dash frame. It was they who put the thick cut-pile carpeting in. And the more they did, and the more they charged, the more they sold and the more it became a status vehicle. If cost equals status Jeep sure had that here these things were hugely expensive to buy new and the running costs are astronomical without cheap US gas and then it rusts away on you, Despite comments from Norway Ive found Landrovers and Rangerover to be reliable IF you service them. Landrovers were used as fleet vehicles by government depts here and those saw hard use and they stand up to it. Land Rovers have been consistently on the bottom of dependability reports like JD Power seemingly forever, at least when they started expanding away from the classic round headlamp Range Rover. They are expensive to buy, expensive to service, part prices are incredibly high and most service procedures are complicated. Their popularity defies reasonable rationale, the only way I make it work in my head is that they are extreme status symbols and as a consequence, reliability and costs are trumped by perception. Such a service life would not be tolerated by mass market brands. an LR3 supercharged cheaped used $800 each wholesale. It will be a cold day in h*ll I ever own one of those after the warranty. This thing will always remind me of the 1988 movie “Baby Boom” with Diane Keaton. Although I couldn’t care less about SUVs, I like these due to their interior luxury appointments. If I recall correctly, weren’t these things the first true “luxury SUVs”? As far as the early nineties downfall, wasn’t it due to the fact that by this time GM, Ford, and others had started making their own luxo SUVs? The Suburban was picking up steam, but was larger. Even then, Chevy was still selling the version that went back to 1973. The new one would not hit until 1992, and it would go on to rack up monster sales. The Explorer was quite a bit smaller. There really wasn’t a real luxury domestic SUV when these were discontinued, this was still the pre Escalade-Navigator era, some were starting to offer some luxury features like leather and dual power seats etc. 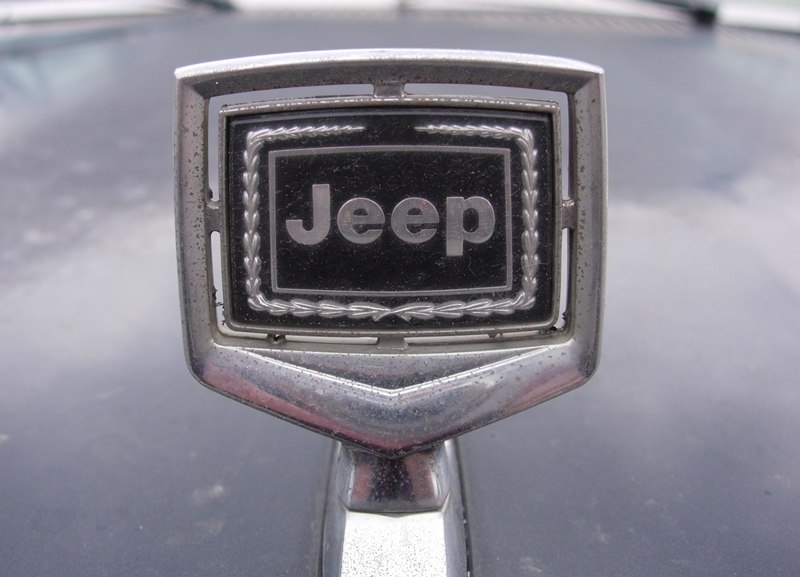 Jeep had Limited versions of the new Grand Cherokee, and GM was adding higher end versions of their SUV’s, Oldsmobile was one of the fist car brands to cross over into the SUV fringe with the Bravada in 1991 or so. Ford had the Eddie Bauer trim trucks, but it was still offering the 2 door Bronco at the time, the Expedition was still 5 years away. Rich folks bought Suburbans. They really weren’t a large come down by 1987. Around ’86 or ’87, a friend and I were stranded in the snow, not that we had a car with us in the first place. His high-brow mother’s boyfriend picked us up in his new Grand Wagoneer. 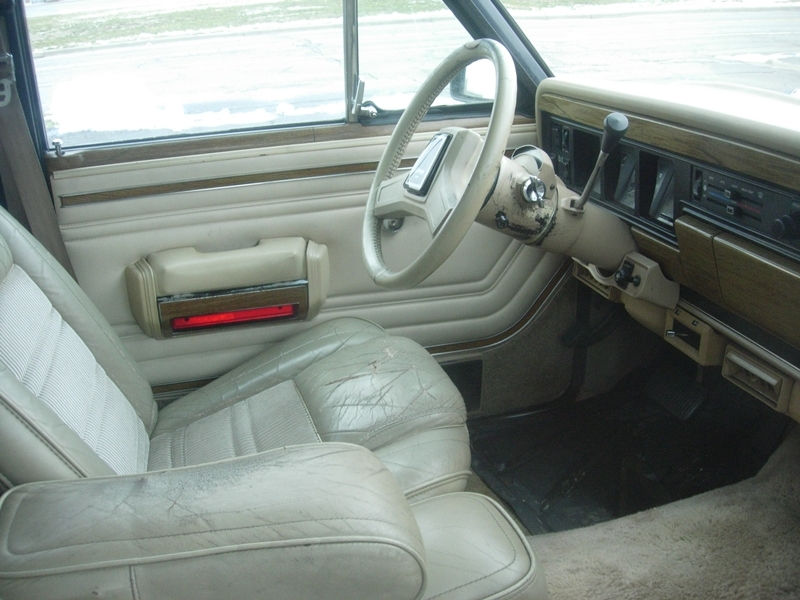 I had some old Cherokee or Wagoneer experience from a few years previous, but I was shocked at how cramped and chintzy it was when I got into it. At some point the fundamentally excellent chassis wasn’t enough to mask the lack of space efficiency and interior development dollars, and that time had come by 1986. OTOH, these things are collectible while Range Rovers aren’t worth their weight in beer cans. There are good reasons for this. For me, the movie that brings back memories of this vehicle is “What About Bob?” It’s what the good doctor drove upstate to the vacation property, which is exactly how many of these vehicles were used. Always loved the Waggys and Cherokees for their looks… never loved their propensity for rusting out quickly and badly here in road salt country. Goes hand-in-hand with how the bodies and trim always felt a bit, well… cheap? flimsy? Neither is quite the right word – they certainly used thick enough metal – but something always seemed off about those bodies and interiors. Maybe it was just the flatness of it all, combined with how everything tends to be falling apart after 20 years. My old man picked up a green ’75 Cherokee, straight six/auto/part-time, for a couple hundred bucks back in 1990. He was a strictly GM man, so it always seemed an odd choice to me (but at four years old, what did I know about the sweet economics of finding a $200 4-wheeler?). It was a strictly unremarkable vehicle that would end up getting junked due to a bad rear-end a year later. Almost exactly twenty years after that, I yanked a very similar one out of a barn – same color, but a ’79 with full-time 4WD and a 360. 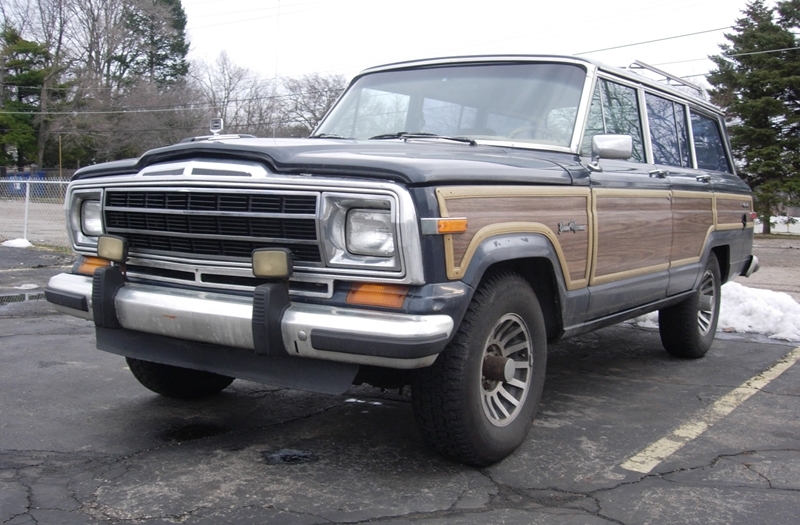 It was way too minty for me to keep, so I sold it for an obscenely large profit (septupled my money) and grabbed a cream-colored ’86 Wagoneer much like the one pictured above. It was cleanish when I bought it; my plan was to remove the wood, paint it that ’70s Jeep burnt orange, and install some AMC/Jeep aluminum slots. But it only took one winter for the tin-worm to start doing its thing. It ended up becoming my plow truck, complete with re-tinned rockers and quarters before letting it go to a neighbor that ‘had to have it’. I have always loved the classic look of those Grand Wagoneers. Perhaps because my grandparents had a red and black Cherokee Chief up until 1992. It had vinyl seats and the only power option(besides brakes and steering) was a power rear window. Around 1990, the Grand Wagoneer had the highest average income of all new car buyers of an American nameplate vehicle at around $200K. That record might still hold and certainly is among the highest of any vehicle sold that is considered mass market. We worked on a 1991 GW in January that was owned by a guy whose original owner was his mother-in-law who was now living with them. The vehicle had been parked for some time and had transmission troubles and other sitting around issues. He told me someone offered him $4,500 for it as is. He thought it was a joke. Aside from the few mechanical issues, the car was a clean garaged one owner southern vehicle. I told him, we could put a transmission in it, get everything else working, clean it up and ask $10K. he still did not believe me but figured if he got $4,500 AFTER the work he would be ahead by some. So we did. He balked at the $10K asking price but eventually agreed. We paid my detail man’s son a crisp bennie no questions asked he went to town and made the truck look like a million bucks. We advertised it, I told him to not be so quick to bring the price down since I was confident that it would sell well as is. It eventually sold for $12K to a guy that drove 4 hours with a cashier’s check and bought it. OK for you What Ifers… Here is a Photoshop that has been circulated around the net a bit for 2014 Grand Wagoneer based off the old Grand Cherokee. I like that concept, but I don’t believe it would pass current imbecile-impact rules. Nothing that good looking can, apparently. Heck, you could probably see out of it too, and that won’t do at all. 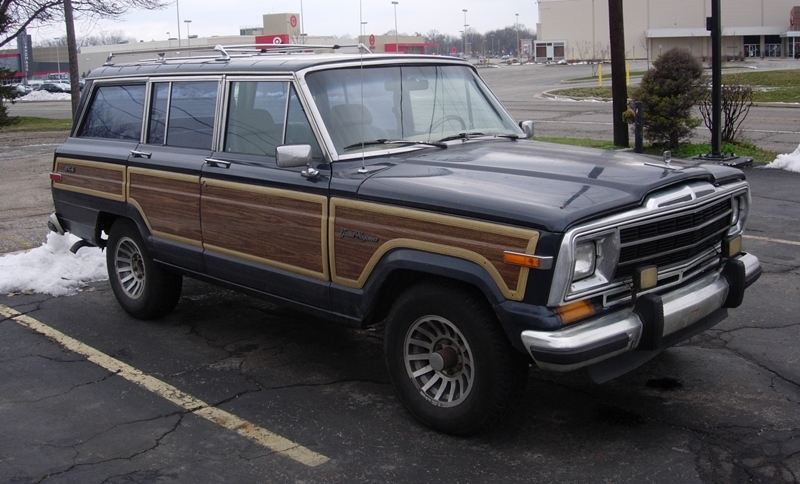 First…when the Wagoneer was released, it was as a WILLYS. That’s right – Kaiser Industries owned the company from 1954, but it was still doing business as Willys Motors until mid-1963. The Holy Grail of Wagoneer collecting, is to find a Waggy with Willys Motors on its manufacturing plate. They do exist. I saw one in a boneyard, 25 years ago. Puzzled me, too, at the time. Second…theories about the lack of advertising on the SJ/J-Series in their last days. I’m convinced there was a certain amount of passive malice, as there always is in mergers and takeovers, from the Chrysler boys towards this Kaiser relic. All advertising on the FSJs ended with the announced Chrysler buyout – the pickup died almost immediately (1988 specs were published but there’s no evidence of any made or sold) but the Wagoneer, as a status symbol for the Aspen set, took longer. They didn’t want it. Proof is, they didn’t even make the mild mods to put their own 360 engine in it – just kept running the AMC engine line, knowing it had no future in product plans, deciding the SJ had no place in them, either. To run a low-production line would have been a distraction – there was nothing to be learned; it was a dead-end model line. But the equipment was fully amortized; the engineers were long ago not only paid for but retired and buried. It was all cream. It could have been CONTRACTED OUT. Yup…AMGeneral or a small start-up could have run the line, tried their hand at making improvements…getting experience and a track record. 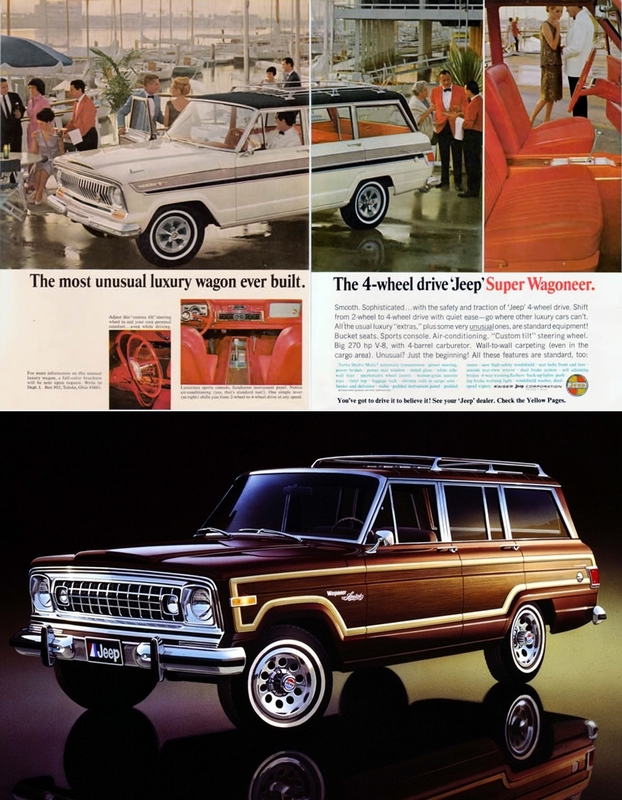 It could have been sold out of Jeep stores…Wagoneer by Jeep, built by XYZ. Not unlike the way the Avanti was kept going, but with use of a marketing network. Mahindra, the Indian tractor maker who makes domestic Jeep-like vehicles, started that way – making Willys Jeeps under license. From a garage where they assembled CKD kits, they grew to a full producer, who, by Indian standards, is fully competitive. By now, it would have been dead; but by now, whoever had done it would have either moved on or would have grown to where they could run alone. What would be in it for Chrysler? Showroom traffic; and dealer and regional sales mark-up. It would have been a win-win; few potential SJ buyers would have been excited by the coming Liberty. I did not take time to look into it, but have wondered if there were some safety regs that took effect in late 91 or early 92 that would have required some expense and engineering to comply. This could explain how a handful of vehicles were supposedly built in calendar 1992 but still titled as 91 models (if that’s what really happened). I’m thinking either air bags, or maybe a bump in CAFE for light trucks about that time. I almost made the statement that Chrysler stopped all promotion, as I could not find any ads for the last few years. To me, with a new dash/steering wheel with air bags and a switchover to Chrysler engines, this thing had a few years left in it. I think it could have done well in the 90s. Or, it was still on a frame, a new body (a-la 92 Econoline or 92 Crown Vic) that kept a traditional Jeep look could have done even better. This was a niche that nobody in the US industry was exploiting in the 90s – everything else was either bigger or smaller. Chrysler could have had a better Navigator/Escalade. Land Rover and the Land Cruiser (and Lexus variant) got handed this market. I don’t think it was as sinister as that. I don’t know what Chrysler’s rationale for marketing the Jeep GW but it was widely believed that Chrysler bought AMC largely for the Jeep brand. Given at the time the GW was selling well then and very profitable, it would make no sense to cut it. Maybe not invest in a new model but when a business case is made to keep something it is usually kept. I found a press release from February 1991 sang that Jeep may discontinue the GW in the fall of 1992, ultimately production stopped in summer 1991. My eerience tells me that the combination of it aging as a status symbol, the recession, probably did it in more. The GC was build in Detroit not Toledo so there wasn’t a capacity issue. Chrysler did offer a GW model for 1993 on the Grand Cheroke that wasn’t popular but the GC was a smash so perhaps the market just moved on. Are you sure it was made in Detroit? The SJ, former J-Series vehicles, were initially built at the then-only Jeep plant in Toledo. AMC moved NEW or significantly-redesigned Jeeps into their network of plants (the CJ7 and YJ were made at Brampton) but something unchanged…it wouldn’t have made sense to move the assembly line; especially since there were rumors of replacement from 1980 on. Frankly I think that’s why it was left alone as long as it was – it was out of an old, obsolete plant, with a company with an excess of capacity. So long as it cost nothing, just let it go on…old AMC engine and all…until the time came when the truck, the plant, the engine, all were slated for elimination. I looked into this, and can confirm that these Waggys were built at the Toledo Stickney plant from 1981 to 1991. It is my guess that they were built at the Toledo Parkwood plant before that, which was the original Willys-Overland factory going back to 1910. 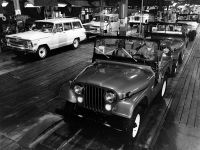 There is a photo from the 60s of a Wagoneer coming down a separate line from the CJ assembly line. I don’t know if GW Would need restraints because they were trucks. CAFE wouldn’t have been an issue for Chrysler. CAFE was flat after 1985 and with all the K cars Chrysler did not have trouble meeting it. Chrysler tried their hand at a “big Jeep” again with the Commander, but that found few takers. Yeah, what happened there? Too expensive? Too bland? Too similar in size to the Grand Cherokee? It was during the Daimler era. The interiors made Rubbermaid look like high end stuff. They just had no appeal, and while bigger than a GC, did not have enough room for a 3rd row of seats. Odd size and not appealing in the least. A terrible flop. They kind of looked like an old 80’s Cherokee that was stretched, there was really no character to any of the styling, if it would have had some retro hints of the old Grand Wagoneer it could have done better. You may never get the chance to sit in a vehicle with an interior more horrible than the Commander. A low seating position combine with a high belt line and dash to make you feel like you are sitting in a gun turret (I have no idea how a short driver would see out the windows safely). The interior plastics are very cheap and the ergonomics are awful. Subjectively the exterior is, at best, an acquired taste. You really have to wonder how the Commander got through the development, engineering, budgeting, and marketing process involving thousands of people and millions of dollars…and nobody mentioned that it was ugly. Actually, if you have worked with Daimler you can understand…. The Wagoneer is a true Classic, a great design then looked good and sold well for four decades. The opposite of the Commander. You’re right, of course – and it shows the problems at the root of the parent company, vis a vis Renault. The sharp young Frenchmen, working on the original Jeep theme, knocked one out of the park with the XJ. Seems, so long as they were using AMC fundamental parts, they were brilliant in conception and fully competent in execution. Daimler, bearing the herald of “QUALITY! !,” came up with a dull design, poor ergonomics, nickel-and-dimed interior…looked like an expanded knockoff of the XJ, fitted as if the designers looked down on their American customers as rubes. And it showed; outside and – you say – inside as well. 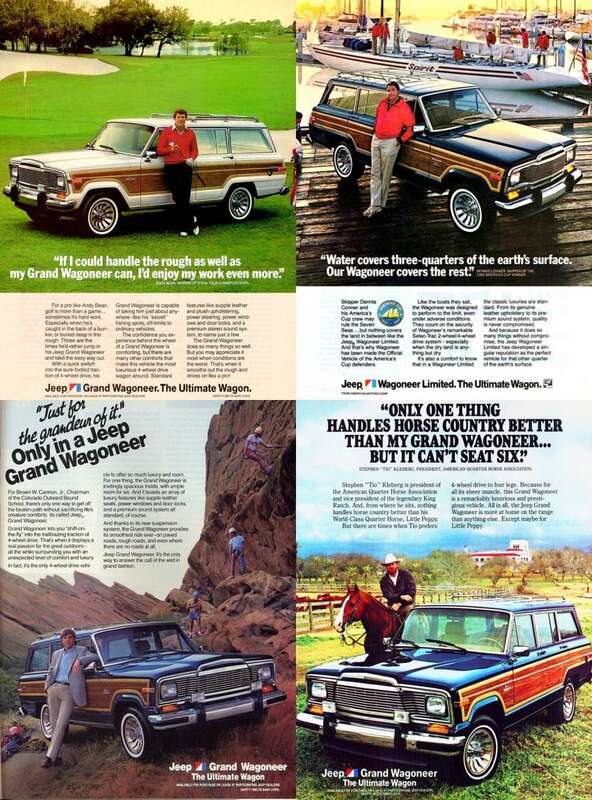 I always wondered why Jeep didn’t name Commander ‘Wagoneer’ instead and try to re-leverage the name, history and emotion around Wagoneer to try and drive sales.. There is an active International Full-Size Jeep Association that supports these, too: http://www.ifsja.org/. I’d be out looking for one but they’re not compatible with my 60-mile round trip commute. JPC you and Paul have a knack for writing articles that go perfect with a morning cup of coffee. Well done as usual. I didn’t pay attention (I’m not a truck guy) until they went with the large chrome outside mirrors. That single change caught my eye and reminded me the GW was an old design that was still in production. I followed it until 91 and believe it was the last American car built with a carb. The Olds 307 ended production a year earlier. Actually the ’94 Isuzu still had a carb- at least the base model. My BIL has one that I used to borrow quite a bit. Nice writeup, and a nice example of a GW! I know there was also a brougham version as well, according to wiki it was introduced in ’81. That’d be the one I’d want! 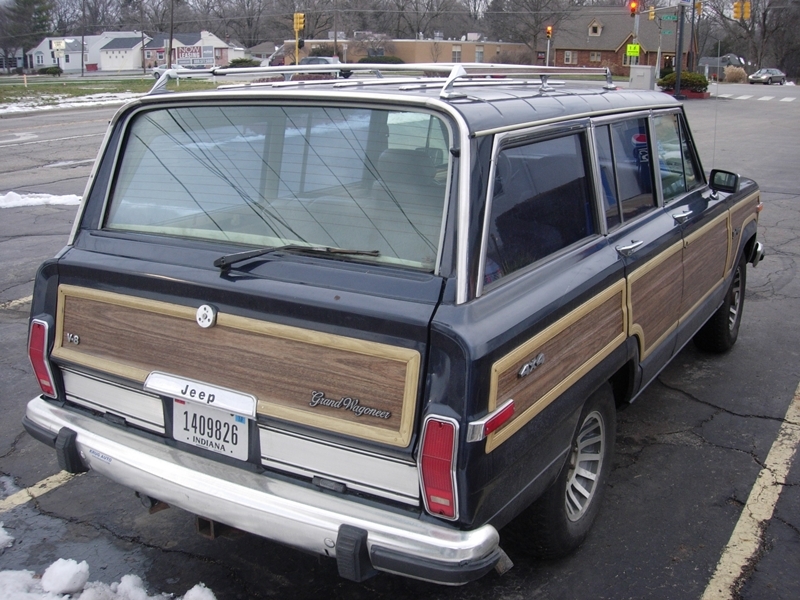 The Grand Wagoneer was built at Stickney Ave in Toledo from 1981 until the end in 1991. By then there were only 350 workers making the big Jeeps. The 1993-on Grand Cherokee was built at Jefferson Avenue North in a new plant erected just for that. While the cost of materials might have been low for the GW, you reach a point when fixed costs eat all profits. By Feb 1991 GW sales were down to about 250 a month that’s like 10 per day in the plant. Both Stickney and Parkway were demolished in 2005 for a new plant called Supplier Park that makes the JK Wranglers. Toledo North was constructed to build the Jeep Liberties. Parkway built all the military products and the earlier models. Allpar has a nice write up about the Toledo complex. I know that the YJs from 86-92 were finished at the old Brampton plant but a lot of pre assembly was done in Toledo. From what I understand AMC split production of cars between Kenosha and Brampton I depending on final destination. AMC built a second plant in Brampton called Bramlea but once the original Brampton plant closed and was torn down was renamed Brampton II. It was interesting how AMC massaged their capacity over the years. I know the CJ production was split between one of the AMC plants and Brampton. It’s actually a find-the-Jeep game among CJ owners and enthusiasts…American CJ7s (and all CJ5s in the late AMC era) have “Jeep” stamped on the kick panel forward of the door cutout. Brampton CJ7s (and all YJs) have “Joop” stamped, with the “e”s only painted over. If you have a Joop, it’s a Canadian build. But the CJs in those days, and the subsequent YJs, were big sellers. Made SENSE to move production to a more modern plant. Back before Jeep really had a following, CJs, Wags, Gladiators, panels…were all made on the same line. 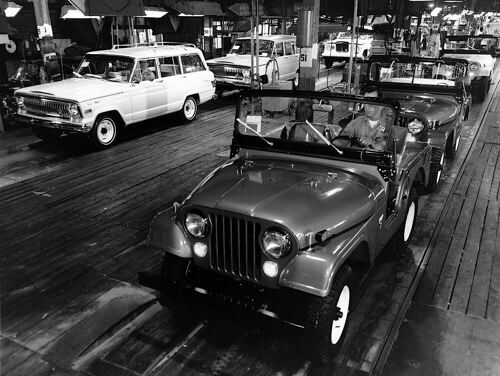 Allpar, I think, has a photo of the 1969 assembly line…a Wagoneer coming down the line alongside a CJ5. Production in those days probably was similar to Studebaker Hamilton – a car every half hour or so. LATE EDIT: JPC has the image posted above a few comments. I have read that the GW assembly line was torn down after production ended in 1991 as well as it remained open and another some Wrangler production in a move to draw down Brampton I for eventual closure since it was tiny compared to Bramlea and Bramlea was severely under capacity until the LH cars began. I still don’t believe there was anything sinister afloat when Chrysler acquired Jeep about the GW it would have not made sense. Chrysler bought AMC mostly for Jeep and at the time of negotiations the GW was booming and very profitable. Maybe Chrysler had no plans to build a direct GW replacement but their addition of a GW trim line to the ZJ showed they recognized a potential need. 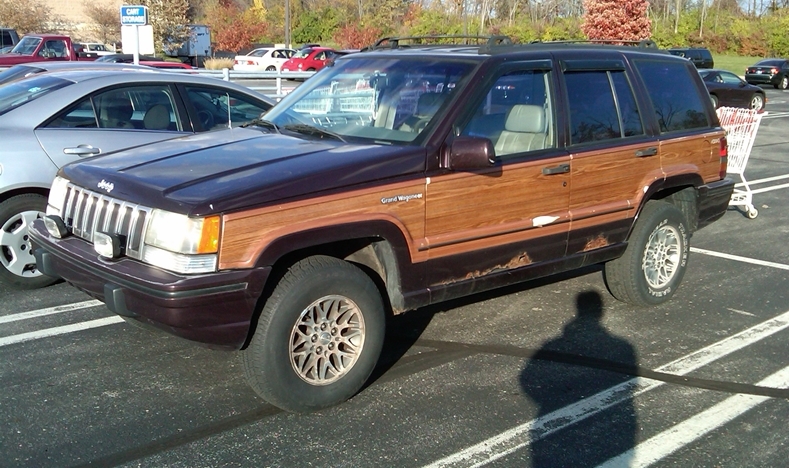 Perhaps old Wagoneer buyers just bowed to reality and bought Grand Cherokee Limiteds that sold well. The GC was somewhat of a status symbol of it’s own for a good long while until the big SUVs like Navigator came out. I have always liked Jeeps even most of the new ones because even though the are now most a Daimler or Chrysler or now Fiat product, their styling, stance, capabilities and flavor feel very authentic American. Kind of like wearing cowboy boots and jeans sometimes. I suppose that is why the Jeep brand is popular even though few really use the capabilities. We picked up a ’73 Waggy a few years ago, and she’s way more fun than I thought possible. Gets thumbs ups everywhere we drive her. The tin worm has claimed most of the GW’s around here, thanks to the liberal use of road salt in the winter. A friend of mine had an 89 GW before. At least 6 years ago I welded a new floor in it for him. Anyhow, last night while watching my son’s soccer game, look what drove by. The CC effect strikes again! This is the first time that I have read anything about an overdrive transmission being installed at the factory into the Grand Wagoneer….Online info that I see indicates that the only factory installed transmission was the 3 speed automatic. I worked as a Jeep salesperson in the late 80s. The Cherokee Laredo 4.0 4dr was the bread and butter, but we still had a fair amount of people interested in the “Grand Dragon”, as we used to call it. In ’88 the people shopping for the Grand were mostly repeat owners, many trying to snag one before they were discontinued. I had driven a borrowed ’86 pretty extensively on road trips, and I was an enthusiastic salesperson ? We also got a -lot- of calls for the already discontinued Eagle 4×4 sedan. The Grand drove very well, and customers said they were competent off-road. I think they should have stuck it out for a couple more years. The Jeep Wagoneer was imported by Iran and the Jeep Simorgh from 1963-1967 and renamed the Jeep Ahoo from 1967-1974 licensed by Arab – American Vehicles(AAV) of Eygpt. We never received the Grand Wagoneer over here in the UK (we did get some RHD conversions of other FSJs, but never the Grand), but having seen them in plenty of American movies, a late model Grand Waggy became my dream car. We’ve recently finally managed to get our hands on one – a 1991 in the rarest Hunter Green that had been imported to the Netherlands from the US in the mid 2000s. There’s nothing in the world that beats driving this thing over here. Everybody stares at it as its probably the first they’ve ever seen, plus it just has a level of class and timelessness that no Range Rover has ever come close to.